it has become increasingly noticeable over the years, that, aside from residing at the centre of the known universe, islay also occupies a unique meteorological niche in that universe. though i cannot claim to be fully awake when my alarm switches on each morning, just priort to being informed as to various happenings around the world, the met office happily regales us with the climatic conditions that may or may not brighten the day to follow. we are located some 25 miles north of northern ireland and goodness knows how many cubits west of scotland, yet it often appears that the forecasts for one or other of those regions seem not to apply to this portion of the hebrides. thus, when planning the following morning's velocipedinal wardrobe, sartorial dilemmas abound. by way of a perhaps poor example, having donned bibtights, long-sleeve jersey and outer shell for an exploratory expedition this past saturday, i found my garmentage to be just a tad on the warm side, particularly since the promised rainfall did not materialise until well after teatime later that same day. on the basis that said rainfall would continue overnight (which, to be fair, it did), i laid out similar garb for the sunday morning ride. i cannot deny that there was sporadic precipitation throughout the mornings perambulations, but very much against recent trends, the ambient temperature had warmed just a tad. sufficiently, in fact, to create that well-known boil-in-the-bag sensation, but clad in a jacket that in truth, was just too bulky to roll up and stuff in a back pocket. still, as my mother was always want of saying when i was knee high to a chainset, "pride bears no pain", a saying that probably has little relevance here. unfortunately, this state of affairs is not an isolated incident, for more than just yours truly has declared a state of overheating on arriving at debbie's ready for the day's explorations. but, in the face of often persistent, soaking drizzle (or even mizzle), one scarcely wishes to find oneself rusting due to incorrect or inappropriate mode of dress. and, at the risk of stating the obvious, it is likely not only the cyclists who will feel the wrath of ferrous oxide. it ill behoves any of us to forget the iniquities visited upon the bicycle chain, but it seems many of us do. thus, the attentive cyclist will not only clean his/her chain with unfailing regularity, but fearlessly apply an approprite lube to keep it running smoothly and prevent the rather scary looking orange rusty coating that often greets the opening of the bike shed door. 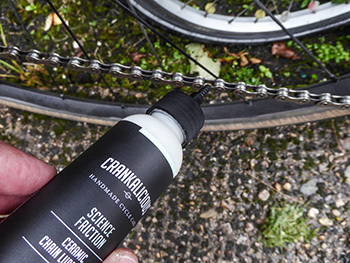 essex-based crankalicious offer a range of bike-care products hand-made near stansted airport, one of which is the cleverly named science friction ceramic chain lubricant. as luck would have it, the chorus groupset on my ritchey logic received a brand new, shiny chain at the same time as a box contianing a range of crankalicious products arrived at the croft for review. and even better, providing the ideal opportunity to give several drops of science friction a hard time, it rained quite a lot. despite being told to do so by the instructions on the £10, 100ml bottle, i inadvertently neglected to wipe the excess lube after application, resulting in a less than shiny chain 'pon my return from an extensive training ride (i know you believe me implicitly). subsequently wiped with a rag, the ceramic lube appears to have clung tenaciously for an appreciable period of time, to each bushing along the length of the campagnolo chain, offering a pleasantly quiet ride and fending off rainwater and splashy puddles with aplomb. a tenner is hardly a colossal amount to offer peace of mind when the weather turns foul, as it inevitably will over the coming months. 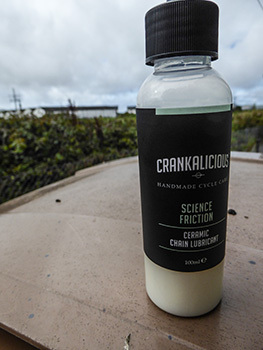 you may already have your favoured lubes on a shelf in the bike shed, but if you've yet to try crankalicious' 'science friction', might i humbly suggest that you clear a small space on the selfsame shelf. life (and by life, i, of course, mean cycling) is full of transitional periods, the majority engendered by seasonal climatic conditions. it cannot have escaped your attention that the majority of garment providers feature both spring/summer and autumn/winter ranges, partly to entice us away from our money, but also because those two transitional periods do tend to necessitate differing velocpidinal garb. assuming we're all much of the same mind, the act of cycling, whether for work or leisure, is a repetitive action. for those commuting, it may well be far preferable to taking the bus, car or train, but depending on how much you like your job, it might be every bit as onerous, yet more economic than the alternatives. we, of the cognoscenti, do it because we love it; because there's nothing better than dressing head to toe in lycra, polyester and/or sportwool, dragging the carbon fibre kicking and screaming from the bikeshed and heading into the sunset. i am regularly reminded of how insignificant is my sunday morning bike ride, when followed by one of those 40 foot articulated tankers that service the distilleries or, perchance, a tractor towing a trailer the size of a glasgow tenement. though it might appear to be only an educated guess, the chances are that either of the above are working, while i, on the other hand, am simply playing in circles. it's the same philosophy i have extended to riding in torrential rain and galeforce winds; no matter how wet i become, i can have a warm shower and get changed when i return home. because i'm not actually going anywhere. so, rather than moan endlessly about my 'right to the road', i'm cognisant of the fact that i travel a darned sight slower than any motorised form of transport. and based on the previously mentioned knowledge that i'm only playing, if i have to pull off the road into a passing place, so be it. that does not extend, however, to playing second fiddle to vehicles that attempt to overtake on blind corners; in an attempt to obviate the latter situation, i mostly hog the middle of the road, just this side of the white line in the vain hope that it will give any following motorists cause for second thoughts. unfortunately, that rarely happens. though it ill behoves me to advertise this repetitive nature more than absolutely necessary, ian clark has provided an effective remedy to this apparent conundrum. 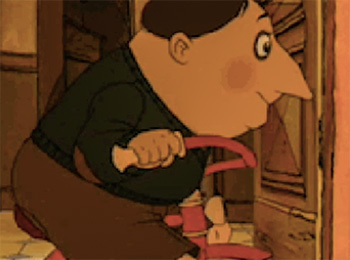 his compact and bijou video about the joys of cycling consists entirely of animated gifs culled from the interwebs and skillfully melded into a single presentation. "I enjoy making films, having previously posted one about Cuba's cycling culture a few years ago. However, i get frustrated by the number of projects that never come to fruition due to a lack of available time." one of the almost inadvertent beauties of ian's movie is the uncurated randomness of the footage; basically a case of using whatever he found to promote the joys of cycling that we all take for granted, rather than concentrating on producing specific clips. "I've been experimenting in simplifying the process, by just using the internet and my phone to gather content and edit it in a way to tell a new story. My first attempt was about train travel, with which I was pretty pleased. I wanted then to push a bit further and bring a more human element to my movie clips. As a keen, yet very amateur cyclist, I decided to focus on that. The freedom of cycling is quite universal." though it would be a simple matter to compare and contrast the simplicity of iain's intent with the growing complexities of the modern-day bicycle, i hope to resist the temptation. 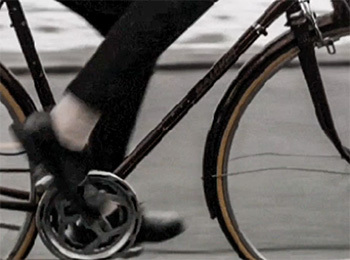 moving pictures such as his video, 'searching', edited on a samsung s7, successfully capture what fun the bicycle can be, if only by realising that someone, somewhere saw fit to create these individual gifs in the first place. rather than spend hours persuading the uninitiated as to the joys of the bicycle, it would be far easier and arguably more successful to simply pass on the link posted below. "If a reasonable number of people watch them, I'll definitely make more. 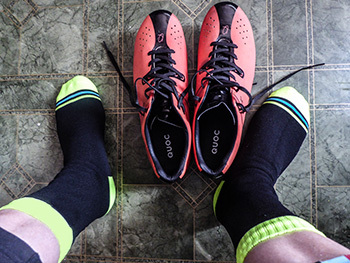 They're a fun way to pass a commute." though not a part of a future personal strategy, i have noticed that my travel to scotland from the principality has been on a downward trajectory. in other words, i've become a predominantly home sort of a chap, rarely straying farther than a bike ride from my back door. quite why this is the case, i cannot reasonably fathom, but for the time being at least, it is what it is. should the notion take me, however, there is a predetermined set of parameters that are followed almost without questioning. as a non-car driver, getting to either of the island's ferry ports is accomplished by bus, a service designed (mostly) to meet departing and arriving boats from the scottish mainland. we're now entering that time of year when autumnal gales will often have ferries diverted from port ellen to the more northerly terminal at port askaig. the disappointing factor affecting the frequency of such diversions is an apparent lowering of the windspeed that makes this necessary. our principal ferry, the mv finlaggan was reputed to be able to berth in winds of up to 50 knots, when, in point of fact, it rarely sails in winds of greater than 36 knots. and now, either boat often finds itself travelling to a non-timetabled destination due to winds gusting to 26 knots. that's about the equivalent of opening the kitchen window. anyhow, to return to my onward travel to scotland, depending on which boat is servicing which part of the timetable, the journey to kennacraig on the kintyre peninsula takes anything from two hours to two hours fifteen minutes. the latter is just slow enough to miss the bus connection to claonaig for a ferry to arran, but early enough to garner a booked seat on the citylink/west coast motors coach to glasgow's buchanan bus station. as a vegetarian, i prefer not to dine aboard the ferry for reasons both of cost and lack of variation in their offerings to non-meat eaters (mac'n'cheese anyone?). 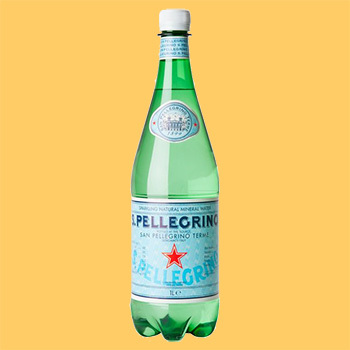 ensconced within my backpack is a sandwich or wrap of one type or another, augmented by a carton of yoghurt and a small bottle of san pellegrino, consumption of which commences the minute i have found a suitable seat aboard the glasgow-bound coach. none of the foregoing is likely of any interest to you, but it does have relevance to anyone undertaking a prospective bicycle expedition anywhere at all, but particularly to the more remote areas of scotland's west coast. you see, i know that i'm going to have need of eating prior to reaching glasgow; three and a half hours on a citybound coach, following on from two hours on a boat are almost guaranteed to incur pangs of hunger, hence the packed lunch. additionally, i generally travel light, carrying only a backpack and thus having no need of loading any luggage into the hold of the coach. this means i can board before the majority in order to find a decent seat and on arrival at glasgow, i have no need of waiting around while the driver retrieves any bags from a well-packed luggage hold. we all go off cycling now and again, hoping that a deflationary malfeasance will not interrupt our pedalling pleasure, but just in case it does, we carry at least one spare inner tube, some tyre levers and at least a mini-pump that fits the valve. just the same as my travel victuals are planned to avoid any form of malnourishment. in the good old days of yore, when touring cyclists were 'real' touring cyclists, not only were they well-versed in the art of travelling repairs, but they'd planned ahead for such an occasional misadventure, carrying cassette removers, spare brake and gear cables and a few spokes taped to the left-side chainstay. and both tyres and brake shoes had been carefully examined prior to departure. cycling, as a means of transport, has moved up the political agenda recently. those of us who believe in the conspiracy theory, would have it that this is in order to deflect public scrutiny from the minstrations over britain's departure from the european union. that particular theory is, of course, undermined by the knowledge that this agenda ascension is also happening in countries other than the uk. so perhaps the bicycle's golden moment is finally on the final landing approach, though it's hard to deny that at least some of this approbation has arrived at the behest of the electric bicycle. either way, beggars (as we might well classify ourselves), probably shouldn't be choosers; if our overlords and masters have finally realised what we've all known for many a long year, would it be undiplomatic to shout 'hooray' and say 'i told you so'? the year 2007 is generally reckoned to be the turning point at which the majority of the global population lived in cities, outnumbering those described as residing in rural areas. it's a trend that shows little sign of diminishing; by 2014, statistics alleged that 54% of the world's population lived in cities and by midway through this century, forecasts point towards this number reaching 66%. tautologically, this will undoubtedly entail an increase in size for the majority of the world's cities, an expansion which might well impinge on the rurality from which many of their citizens originated. as such, those cities will necessarily have to adapt dramatically to not only accept the forecast increase in numbers, but also to adapt and improve their transport infrastructures to cope with differing needs and increased demand. the latter factor will prove necessary not solely to maintain or improve living conditions, but in order to efficiently move people from home to work, to school or to the shopping mall. that there is no 'one-size-fits-all' is made manifestly apparent in this concise book from melissa and chris bruntlett. it's worth my pointing out at this early stage in my review, that the vancouver (canada) based bruntletts are co-founders of 'modacity' "a creative agency using words, photography and films, to inspire happier, healthier, simpler forms of mobility." according to the preface, having moved to vancouver's east-side, they found a diminished need to use their motor car, ultimately dispensing with it altogether and making all their journeys "...by foot, bicycle, public transit and rental car...". this born-again' status, encouraged them to document their new-found revelatory status, leading to a five-week, five city venture to the netherlands "...to gather...inspiring cycling stories and share them through words, photography and film." this they proceed to do (understandably omitting the film portion) over the course of the subsequent 200 plus pages, contending that countries such as denmark may have arguably achieved a higher profile with regard to their allegedly superior cycling facilities at the expense of the less ostentatious nature of the netherlands. i do wonder if this is an exploratory poke in the eye at mikael colville-andersen's copenhagenize, given that the subsequent narrative fails to mention him even once. but then again, perhaps i'm too much in thrall to the conspiracy theory. "The Danish capital of Copenhagen may get a great deal of press and endless plaudits as the world's foremost cycling city - but quite frankly, that is as much a product of effective marketing as (it is) a result of effective policy." i find it slightly sad that north american outsiders should feel it necessary to start making comparisons of this sort; surely the ultimate aim is to improve the world's cycling infrastructure without the need to indulge in point scoring along the way? that said, it's hard to fault 'Building the Cycling City' for its comprehensive and well illustrated exploration of the enviable facilities available to holland's cyclists. 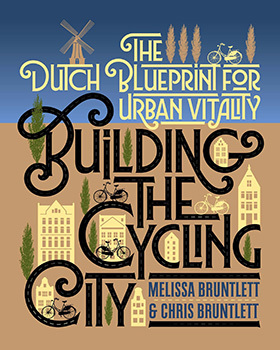 but the bruntlett's are astute enough to realise that part of holland's success in this respect, is due to the fact that "Cycling remains ubiquitous and normal among Dutch teens. No social stigma, no special gear, just autonomy and mobility." compare this with the apparent philosophy pertaining to british and north american youth, where the bicycle is often viewed as a stop gap means of transport until old enough to drive a car. there is many a case study described throughout the book, well-documented, clearly and enthusiastically detailed, but staring at the narrative from a safe and hopefully neutral distance, i can't help thinking that, once again, it's a book that preaches predominantly to the converted. perhaps my cynicism extends just a cycle-path too far, but, just as with colville-anderson's book 'copenhagenize', i have great difficulty imagining anyone other than cyclists reading the bruntlett's treatise in support of the bicycle. 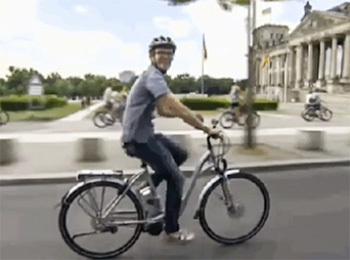 as modern-day cities become ever more complex in their needs, it is hard to think of a mode of transport that will better serve residents who need to travel quickly and safely from a to b. the bicycle is not the sole solution; but it quite likely is the glue that conjoins other modes such as railways, trams and buses. it is, by definition, endemic in dutch culture; it's just what they do, untainted by an obsession with the sporting milieu, more common across the rest of europe. the almost insurmountable obstacle in british and american cities lies with a predominating car culture. expecting that situation to change overnight, relies on a great deal more than optimism. and though all of us here need no convincing as to the way of the jedi, it has to be borne in mind that we are frequently in a small minority. it's hard to have folks adopt the way of the chainset if they simply don't want to. i fervently hope that this book finds its way into the hands of those who make the sort of decisions that affect city life: politicians, planners, transport consultants etc. it's an unfortunate fact that, no matter how many cyclists purchase and enjoy this book, it's more often than not the non-cyclists who make the strategic policies that could turn the netherlands experience into a world-wide utopia. i'm afraid the early part of this discussion is going to sound a tad narcissistic, but is the only way i can find a practical way of approaching the bit that, hopefully, isn't. i began writing thewashingmachinepost in march of 1996, long before jorn barger coined the word 'weblog' and some three years prior to peter merholz contracting the word to 'blog'. there are, so far as i'm aware, no up to date statistics demonstrating the number of blogs on the interweb, but suffice it to say, there's probably a a great deal more in 2018 than there was in 2011, when there were reckoned to be more than 156 million public blogs in existence. it's quite likely that the number is something of a moving target; writing a blog seems like a great idea until the concept of frequency arises. originally, having transitioned from a column in our local newspaper, i simply wrote one article (of dubious quality it must be admitted) every two weeks, but as the idea took hold, i updated thewashingmachinepost website (not a blog; at that time, the term seemed somewhat demeaning) a bit more often when moved to do so. there came a time, however, and i'd be lying if i said i could remember, when it seemed a bit of a wizard wheeze to attempt to write something each and every day, from christmas through to easter. having achieved that (not always easily), i've scarcely looked back since. allowing for holidays and the occasional situation where it proves well nigh impossible to post anything, the post has its black and yellow pixels refreshed at least once a day. it probably is hard work, but so ingrained is it to my daily existence, that i pretend not to notice. currently, it's the oldest cycling blog in the world. i must, at this point pay tribute to the many cycle companies who have been kind enough to supply kit for review over these years, allowing me to present features of a more substantial nature other than my often ill-informed witterings. however, thewashingmachinepost is scarcely a commercial venture; it was never set up as such and though i receive enough recompense by way of advertising to pay for my annual webhosting, i'm quite happy to keep it that way. if i woke up tomorrow morning thinking "you know what...", there would simply be more bandwidth available for everyone else. however, not everyone is quite so fortunate. though the wholesale move from print to pixel has not been as drastic as once forecast and many publishers who spent thousands creating ipad versions of their print publications have had cause for a major re-think, there are still many websites in the velocipedinal world, that now take the place of ink and paper. it is also sadly true, that the appetite for cycling magazines of all genres has taken a turn for the worse. witness the demise of cycle sport amongst others and the consolidation of many titles under one roof, where once they revelled in their independence. it would be foolish, however, to think that any apparently related recession applies solely to the world of print. there has been amalgamation of several once independent cycling websites, one that can only affect the survival of several when their new masters observe the manifest duplication of effort. in such cases, streamlining is almost inevitable. and now, it seems, titles that would once have been viewed as the mainstay of this brave new digital world, have fallen by the wayside. factory media, owners of the once indispensible road cycling uk, or rcuk, has filed for bankruptcy. along with rcuk, factory media was also guardian of bikemagic, bmxtalk, dirt mountainbike, total women's cycling and rideuk amongst others. of course, the disappearance of the above mentioned may have had little to do with their own individual performances on the commercial front; according to reports, their recently filed accounts show them to have been struggling for a while and the those all but indecipherable gdpr regulations apparently didn't help, with a sizeable proportion of revenue apparently based on advertising and sponsorships. there may well still be duplication of effort when it comes to print and/or pixel titles and it's entirely up to the readers of both or either to make their choices. but this brave new digital world, which has effectively been thrust upon us from a great height, still affords unrestricted space for pretty much everyone with a vision and a laptop, so it's sad to see some of the better offerings disappear from view (quite literally). blogs such as this one, with little in the way of onerous financial demands, occupying what i like to think is a niche in the market, will probably survive until we/i go to the great arenberg trench in the sky. now, hand me those rose-tinted oakleys.